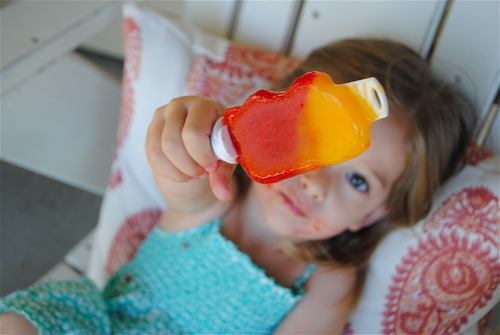 Popsicles are the quintessential summer treat. Don’t they remind you of your childhood? I can recall many a fourth of July spent slurping on a popsicle. With the fourth nearly upon us, I thought this would be a fun throw-back if you will. 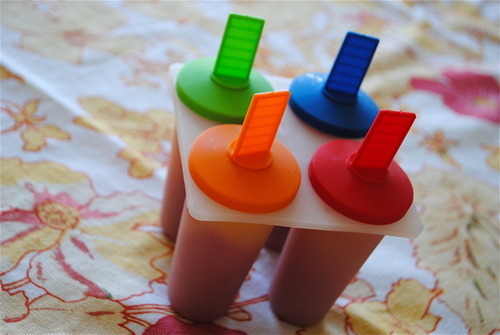 You can be as creative as you want when you make these, or you can be a purist and pour juice right into your popsicle molds of choice (think: grape juice). 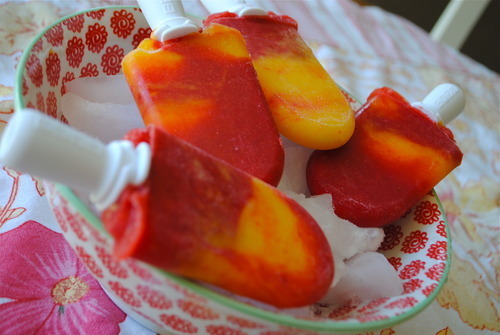 I like both ways, but for today I wanted to make an icey treat that would boast some flavors reminiscent of summer: strawberries, mangos, and lime. Ooooooohweee! I had a lot of fun making these and I think you will too. Side note: I used agave nectar in this recipe. This is a great sweetener to have in your pantry (you can find it in the natural food section of your grocery store). It also has a lower glycemic index. 1 lb fresh strawberries, rinsed, stems removed and cut into small chunks. In a blender pour in water and half of your strawberries. Pulse until it resembles a smooth mixture and no strawberry chunks are visible. Pour in remaining half of strawberries and 1/2 cup of agave nectar into blender. Pulse until you reach desired consistency. I prefer a smooth texture to a chunky texture with my popsicles, so I blended it until the strawberry chunks were very fine, almost completely blended. Taste the puree here and add more nectar if you prefer. Remember: When things are frozen the sweetening and flavor is somewhat decreased, so you want your strawberry puree to be fairly sweet. Next, pour strawberry puree into a medium bowl. Cover and place in fridge to chill. Rinse out blender pitcher and place it back on motor. Now you need to remove the flesh from the mango. Mangos have a long, flat pit in the middle. What you want to do is slide your knife down the length of the mango, removing the flesh in long strokes trying to avoid the tough pit (you will know when you’ve bumped into it). Don’t worry about the skins, you’ll discard them in a minute. When you’ve finished removing all the flesh as best as you can, take a spoon and scoop the flesh out of the skin. I like to do this over the pitcher, so I can plop the scooped mango right in. When finished, pour in lime juice and remaining 1/4 cup of agave nectar into pitcher. Blend until smooth. You could opt to chill the mango-lime mixture right now for 20 min. to give you a head start in the freezing process like the strawberry puree, but I opted not to. You are now ready to pour purees into desired molds. I did this two different ways: I used conventional molds and a quick pop maker. For conventional molds: Pour purees into molds, alternating between the strawberry and mango-lime. Make sure you pour the purees just shy of the top (the puree will expand as it freezes). I highly recommend freezing them for at least 4-6 hours or overnight. If you are having a hard time removing popsicles from molds, run some luke warm water over the mold portion and it will slide right out. Also, if the molds you’re using require you to provide your own sticks, allow the puree to set up and freeze in the molds for 30 minutes then position sticks. Most of us don’t have a quick pop maker lying around. Heck, I don’t even have one lying around. I just happen to have a wonderful mom, who is the queen of all things innovative in the kitchen, who graciously let me borrow hers. Now, I don’t want to step on conventional popsicle molds toes, but with this quick pop maker I was able to make 12, frozen solid popsicles in 40 minutes flat (it takes 7-9 minutes to freeze each set of popsicles solid). Yowza. It was such a slick set-up. If it was in the budg’, I’d definitely be snagging one. I love products that actually “do” what they say they’re going to do. I followed the exact same process that I list for pouring the puree into conventional molds, it just takes a fraction of the time to freeze the pops solid. Recipe will easily make 12-15 popsicles depending on the sizes of your molds.